Every year more than 15 million athletes from over 30,000 high schools will participate in high school sports. Most will dream about playing in college. ONLY 5 IN 1OO HIGH SCHOOL SENIORS WILL GET TO PLAY IN COLLEGE." Use our million dollar college search engine and data base to find colleges. / Search up to 2,200 colleges. / Unlimited Searches to every college in your sport. We don't limit your future. / Access to college coaches e-mails, phones and more for easy contacting. 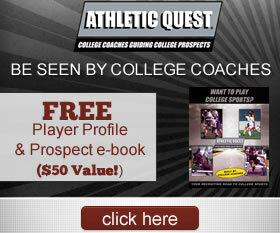 Access to key college recruiting tools that will help you to get results faster and better. / COLLEGE PROFILES. 10 Key Data points to know everything about each college, from SAT/ACT score requirements, to costs, to key links, virtual tours & more. / ONLINE NOTEBOOK. Electronic notes for each college to keep you on track and on target in your college recruiting process. You will need professional resources to help your college recruiting process. / 10 KEY PLAYER POINTS. There are 10 key points of information that every college coach wants to see and needs to know. We will help you with these. / COLLEGE RECRUITING BOARD. Track all the colleges you have interest in and monitor your progress with our Online Prospect Board. OVER 2,200 COLLEGES with athletic teams, more than anyone else. UNLIMITED SEARCHES to every college in your sport. COLLEGE PROFILES built by college coaches to provide the key data you need to make good evaluations and decisions for your future. DECADES OF RESEARCH compiled into an easy to use search engine. THE #1 RATED COLLEGE SPORTS SEARCH ENGINE, easy to use!